You must sign up for an account with Mortgage News Daily to Enable Co-branding. Sharing our reports via email is a service provided to registered users only. Registration is FREE for all users. Existing users, login here. Start a 2 WEEK Free trial now, no credit card required. Share this report with your Twitter Followers. Your co-branded information will be added to the link shared on Twitter. When a user clicks this link on Twitter, they will see your profile information embedded into this report. Subscribe via email and you can share this report with your followers directly from the daily email. Share this report with your Facebook Connections. Your co-branded information will be added to the link shared on Facebook. When a user clicks this link on Facebook they will see your profile information embedded into this report. Subscribe via email and you can share this report with your connections directly from the daily email. Share this report with your LinkedIn Connections. Your co-branded information will be added to the link shared on LinkedIn. When a user clicks this link on LinkedIn they will see your profile information embedded into this report. Share this report with your Google+ Followers. Your co-branded information will be added to the link shared on Google+. When a user clicks this link on Google+ they will see your profile information embedded into this report. Download a PDF version of this report. Your co-branded information will be embedded in the report. You can update this information by editing your profile. Add the following link to your website, email signature, etc. and we'll show your users the latest version of this report, with your co-branded information embedded. You can also embed a co-branded version of this report directly into your website. Click the 'Embed' link above to learn more. Registered users can embed the latest version of this report into their website. The report will update automatically each day. Enable co-branding and we'll personalize the embedded report with your business information. Any user that visits a link in the embedded report be directed to our website where they will see your co-branded information in place of COMPETITOR ADS! This feature is provided at no cost to all registered users. All membership features are 100% free. Register here. You can email any report to a client or colleague by clicking this 'Email' link. As a registered user the email you share will be personalized with the business information from your profile. When a user clicks any link in the shared email they will be taken to MND where all ads are removed and replaced with your profile information. This co-branding (with NO COMPETITOR ADS) feature is part of our suite of free tools offered to registered users. You can also share any report with your followers on social media sites sites such as Facebook, Twitter, LinkedIn, etc. The post we build will include a Title, brief summary and a personalized link that, when clicked, will bring the user to MND and display your information rather than advertisements. We call this co-branded Social Networking and this feature is part of our suite of free tools offered to registered users. MBS Day Ahead: What's Up With Stocks Versus Bonds Recently? Which Real Estate Markets Were Hotor Notin February 2019? More New-Home Sales Are for Houses That Haven't Even Been Started Yet. That's Not a Good Thing. * FHFA averages are updated monthly. ** Mortgage Bankers Association (each Wednesday) and Freddie Mac (each Thursday) averages are updated weekly. MBS and Treasury data provided by Thomson Reuters. 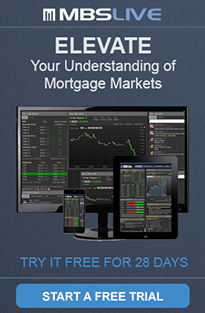 Mortgage News Daily and MBS Live! are exclusive re-distributors of Real Time Thomson Reuters Mortgage Information. This information is not an advertisement to extend consumer credit as defined by Section 226.2 of Regulation Z. This is not an offer to enter into an agreement regarding interest rates. The rates quoted do not include discount points, origination points, or loan level risk based price adjustments. Rates and terms are subject to change without notice. © 2019 Brown House Media, Inc. All rights reserved.